At the press site at NASA's Kennedy Space Center (KSC), one figure stood out among the crowd gathered to watch the final launch of the space shuttle Discovery last year. Arriving on a broad-wheeled, chariot-like buggy called a "centaur base," the gold-helmeted robot was hard to miss. 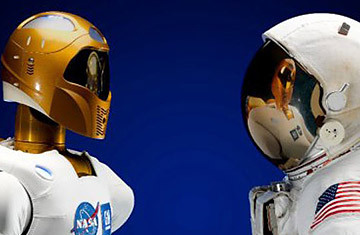 Robonaut 2 (called R2 for short) was aboard Discovery, about to become the first humanoid robot in space. Its cart-riding sibling was at KSC to promote the program as R2 blasted off toward the International Space Station. Hovering around R2's twin on launch day was a team of young engineers clearly excited to see 15 years of work reach fruition. Among the team of proud papas was Kris Verdeyen, an electrical engineer who's been on the project  a joint venture between NASA's Johnson Space Center and General Motors  for more than a decade. He and others put the robot through a series of calisthenics to show off its dexterity. The robot torso is the size of a person and includes key human attributes  specifically arms, hands and fingers  so that it can eventually assist with tasks performed by astronauts on the ISS. "You can use the same tools, you don't have to have robot-specific implements," said Verdeyen. Few things are more uniquely human than a handshake. Nearly a year after R2 arrived on the ISS, R2 performed the first such human-robot greeting in space, with station commander Dan Burbank. After that, the robot used its human-like hands to say, "Hello world," in American Sign Language. It was one baby step toward the ultimate goal: a joint robonaut-astronaut spacewalk.